For anyone new to London in the UK, they may feel it’s a huge place and you would need to get the subway, buses or taxi’s everywhere when sightseeing. That’s not true. You can see many of London’s main landmarks and attractions by simply walking between them. 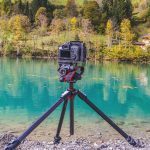 This post is about a self-guided photo route that has 10 stops and you can walk between them. 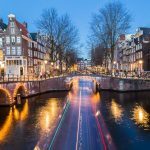 By going on this route you’d get to see a large number of attractions, good skyline views, and of course get plenty of photo opportunities. You could do this route almost anytime, around sunrise, during the day, or at night, with each of these times giving you very different lighting and resulting pictures. With each stop you’ll find a map with directions showing you how to get between each place. 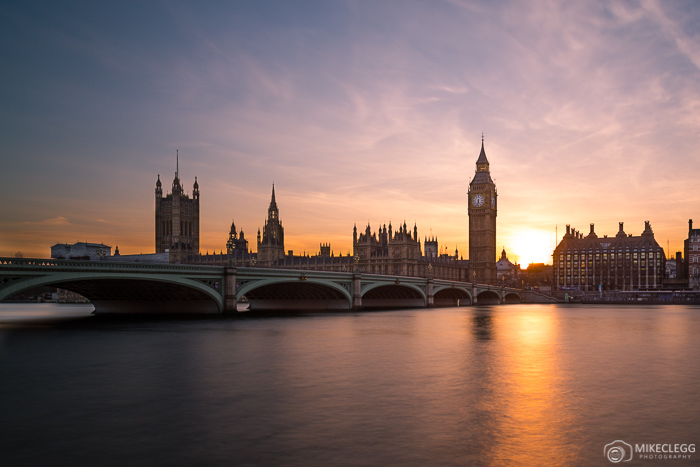 Here is a self-guided walking tour of London and some of the top attractions. We’ll start this self-guided photo walk at London tallest landmark, The Shard. The outside of this building is nice to photograph, but the real photo opportunities come from inside at the Observation Deck (ShardView), where you’ll get some of the best views of London. 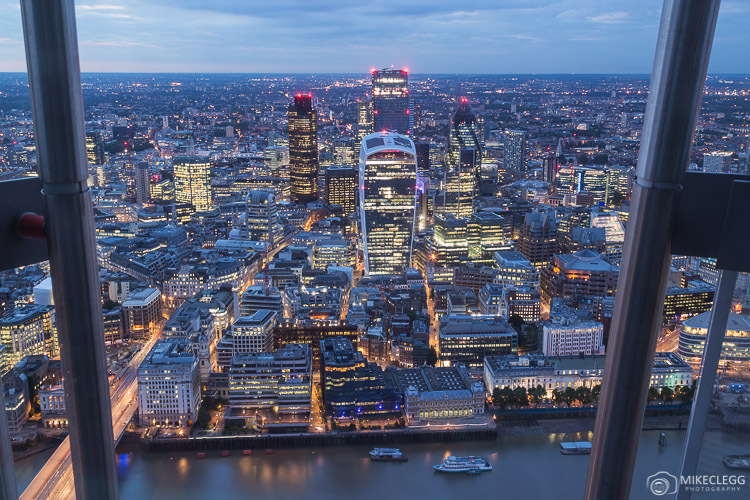 Another way to get views from The Shard is to stay at the Shangri-La At The Shard for the night where you may get spectacular views of the skyline from your room. To get to The Shard take the Jubilee or Northern line on the Tube/Underground to London Bridge, or arrive by overground trains or using a bus. Map not working? Click here to open in Google Maps. Your next photo stop will be from near London’s City Hall. Here you’ll get views towards the City of London Skyline, The Tower of London, Tower Bridge and also back towards The Shard. This spot is quite nice around sunset and also at night. It can sometimes be quite hard to take photographs around here though as “More London” who own the land along this spot are quite restrictive. However, it’s still worth passing by and seeing what you get. The walk from The Shard to City Hall is around 10 minutes. See the map below for directions. Map not working? Click here to open in Google Maps (View route in walking mode). From the City Hall head across Tower Bridge to the north side of the river. One of the best angles is by the “Girl with a Dolphin Fountain” and this spot can be really pretty around sunset and at night. Tower Bridge is beautiful to photograph from every angle, including on the bridge where you may be able to capture light trail shots. It takes around 10 minutes to get to the fountain from the City Hall. When crossing the bridge it’s best to be on the right/East side of the road. You can get to that walkway by going under the bridge south of the river and you’ll see steps going up. 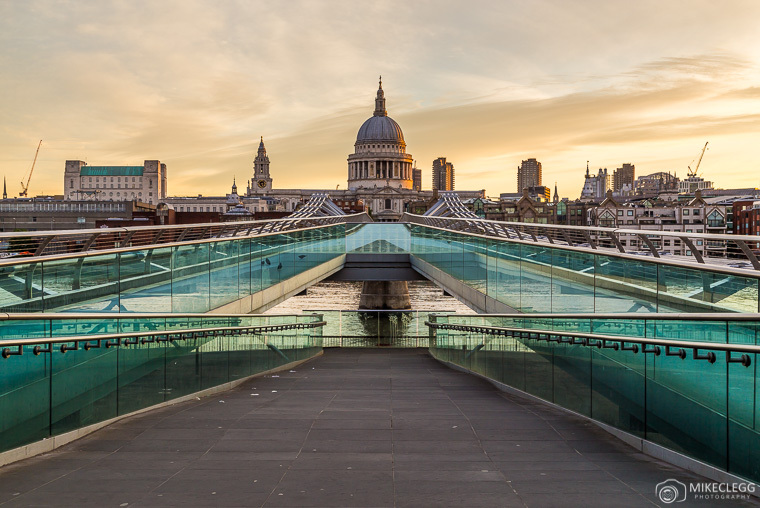 Next walk over to Millennium Bridge for classic views of St Paul’s Cathedral in one direction and the Tate Modern Museum in the other. If you have time you could also spend some time visiting the inside of St Paul’s or Tate Modern. For more information on St Pauls head to stpauls.co.uk and for more information on Tate Modern visit tate.org.uk/visit/tate-modern. This is one of the longest walks and you can either walk north along the river or along the south of the river. I personally prefer the south although the Google Map below is suggesting the north section as the most direct. 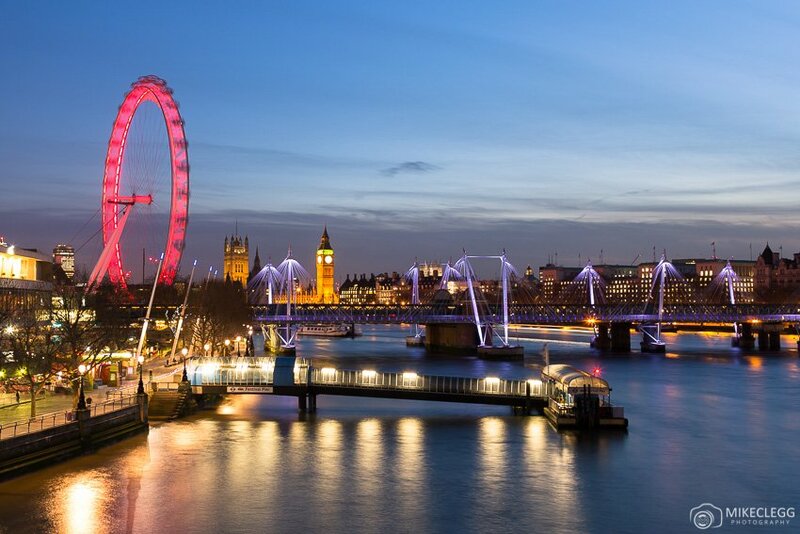 One of the best places to capture postcard shots of the London Skyline, in particular towards the Houses of Parliament, is from Waterloo Bridge. From this angle, you will get Big Ben/Elizabeth Tower, The London Eye, Hungerford Bridge and Golden Jubilee Bridges in your pictures (see below). This perspective is particularly nice around the blue hour/night. From Millennium Bridge you have around a 19-minute walk and I suggest walking along the south of the River. You’ll find several places to stop for food or drink along the way. 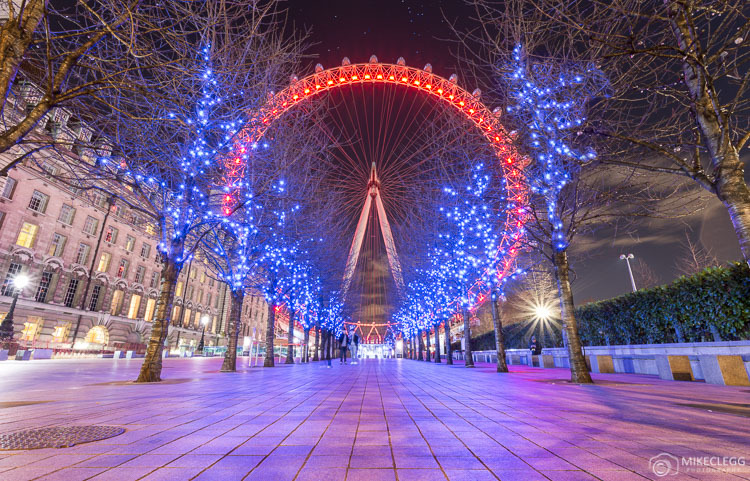 Continue your self-guided photo walk towards the London Eye. This is only a short walk from Waterloo Bridge. It’s possible to ride The London Eye which slowly takes you on a rotation and you get fantastic views of the City. For more information visit their website londoneye.com. Keep south of the river from Waterloo Bridge and it’ll only be around 15-17 minutes walk. Along the way, you’ll find restaurants and places to get snacks. If this is your first time in London then seeing the Houses of Parliament and Big Ben/Elizabeth Tower is probably toward the top of your “to do list”. It would be on mine! 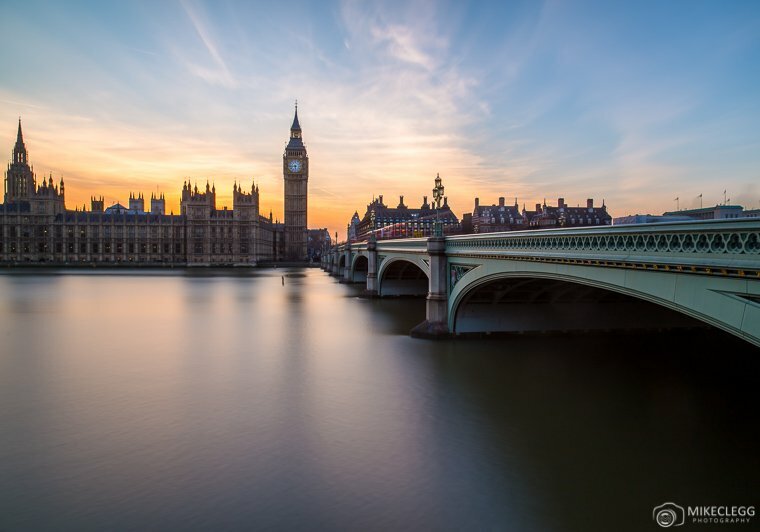 It’s a very popular spot for sunset and good places to photograph include the Queens Walk located on the other side of the River (seen below), as well as on Westminster Bridge and from Westminster Square. If you are taking pictures at night use a tripod to capture classic light trail pictures with traffic. From the London Eye to Westminster Bridge it’s only a short walk and will take 5-10 minutes depending on how busy it is. 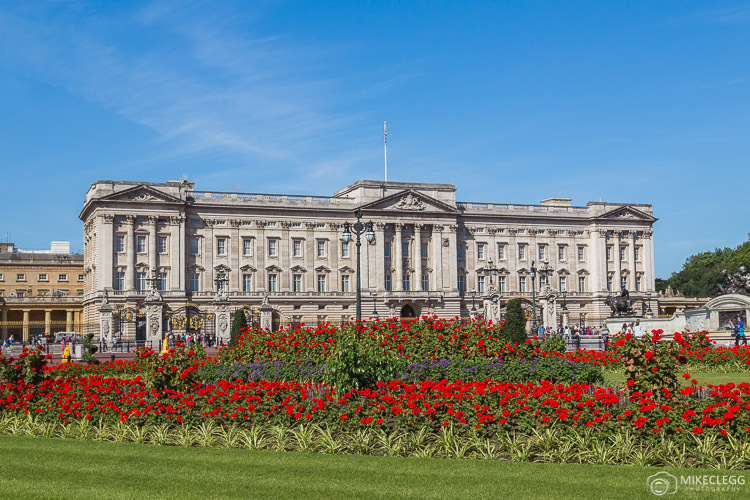 The home of the British Monarch and a must-see attraction. Often late morning you will be able to see the changing of the guard, which is an impressive musical display with the Queens Royal Guards. From Westminster, you should walk through St James Park for the nicest route where you’ll probably get to see ducks and other wildlife. It takes around 25 minutes to do this walk. After enjoying Buckingham Palace, walk along The Mall. This is the long red road directly opposite the Palace, and you will end up at Trafalgar Square. This square hosts many events throughout the year and is the location of the giant tree during the Christmas Season. 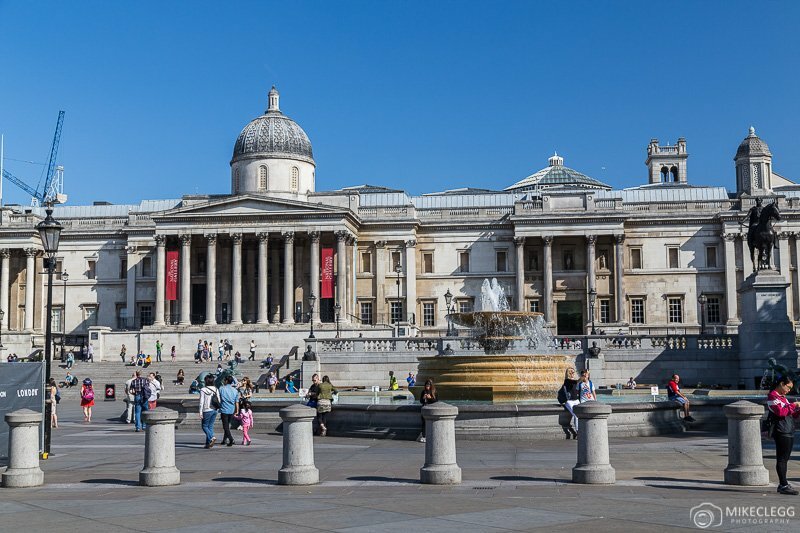 Located around here you’ll also have the National Gallery and also the National Portrait Gallery. For more information on the National Portrait Gallery visit their website here npg.org.uk. For more information on the National Gallery, head to nationalgallery.org.uk. It may take up to 18 minutes to walk to Trafalgar Square from Buckingham Palace and you should walk along the red path in the middle “The Mall”. 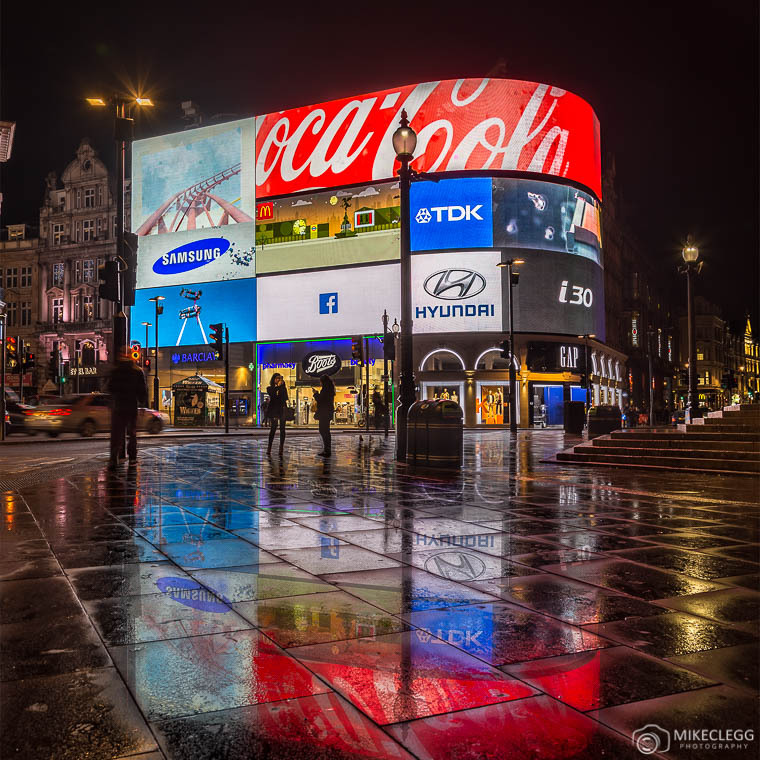 The final location in this self-guided photo walk is to visit Piccadilly Circus which is well known for its colourful billboards and is pretty cool to see both during the day or at night. When taking pictures at night if it’s raining you may also have some luck and get some reflections such as seen in my photograph below. It’ll take around 10 minutes to walk from Trafalgar Square up to Piccadilly Circus. If you wanted to keep exploring and get more photographs, then some of the options after Piccadilly Circus are to visit Leicester Square and onto Covent Garden. Or you could head north up Regent Street where you will then come to Oxford Street. 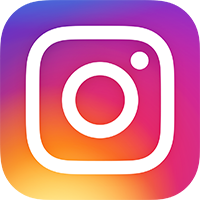 There are tons more great spots all around the city and I list as many of them as possible in my post The Best Instagram and Photography Spots in London. 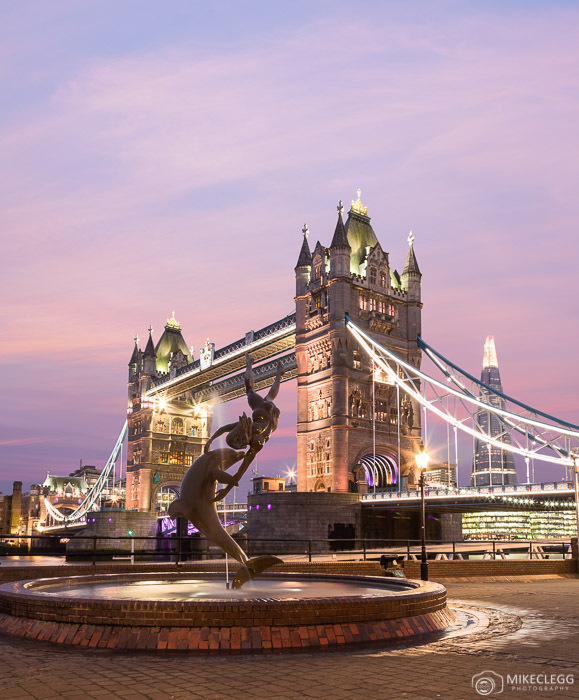 By going on this self-guided photo walk you should be able to see and capture pictures of many of London’s attractions, the skyline and also have a nice walk along the River Thames. Please leave a comment below with any questions or comments. 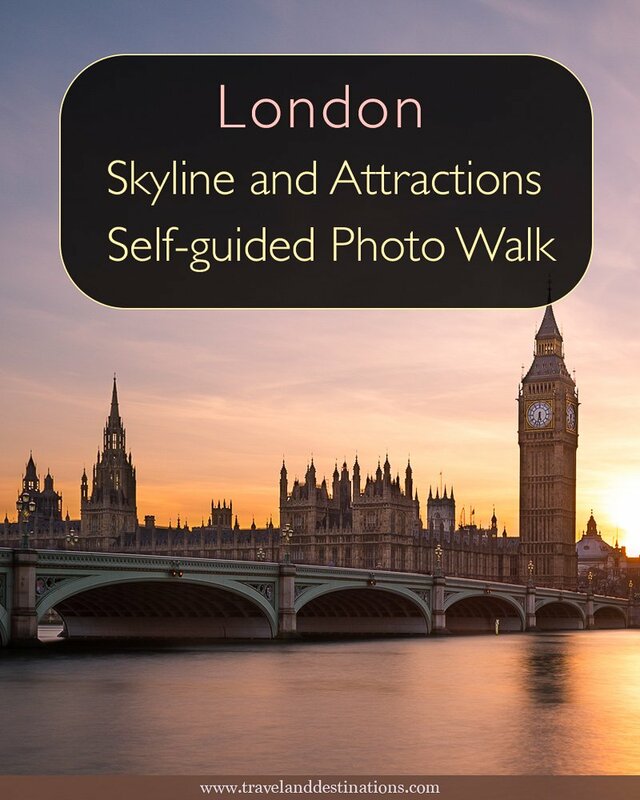 Hey Buddy!, I found this information for you: "London Skyline and Attractions – Self-guided Photo Walk". 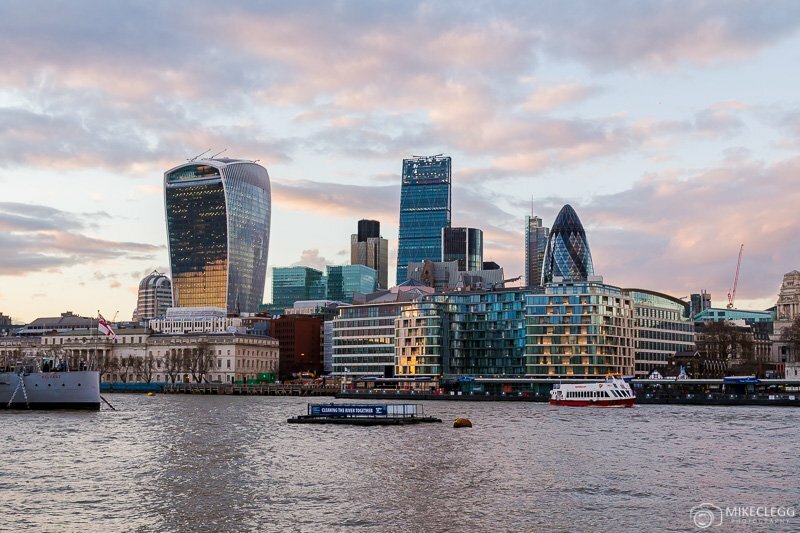 Here is the website link: https://www.travelanddestinations.com/london-skyline-and-attractions-self-guided-photo-walk/. Thank you.